With the number of flu cases expected to rise in the coming weeks, Mayo County Council road safety officer Noel Gibbons has called on people to think road safety. According to Gibbons - "You might think you are obeying the rules of the road and respecting speed limits which makes you a good motorist but many drivers are putting themselves at risk this winter by taking cough and cold remedies that could make them unsafe on the roads. 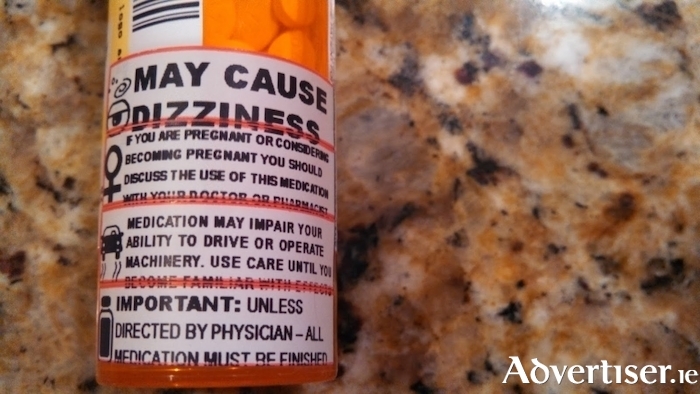 "Medication bought over the counter in pharmacies, as well as prescription drugs, can lead to drowsiness. Motorists taking medication should consult their doctor or pharmacist first. Regrettably too often the warnings on medicine packaging are vague and difficult to find, which causes great confusion and can lead to real dangers on our roads. "Previous research in the UK using a driving simulator, found that people who drove with heavy colds or the flu took 10 per cent longer to react than healthy drivers. This caused them to travel up to two extra metres at 100kph before they started to break. The drivers "under the influenza" were also less aware of hazards on the road if they were feeling ill, it was found." Road safety experts have warned that the effects could be compounded by cold remedies, which can cause drowsiness, and by drinking alcohol. "Safe driving requires concentration and good reactions, both of which are significantly reduced, even by just a mild cold" added Gibbons. "I would advise drivers suffering from these conditions to avoid getting behind the wheel until they are better. If you are not well enough to undertake a journey, it could be dangerous for yourself and other road users. "Severe bouts of common conditions, such as colds, flu, migraine, stomach upsets, infections and hay fever, can affect a driver's ability to drive safely. A heavy cold, for example, can have symptoms that include a headache, blocked sinuses, sneezing and tiredness and these can impair a driver's mood, concentration, reactions and judgement. The dangers posed include driving blind for 65 metres when sneezing at 100kph – and possibly further if sneezing more than once. "It is important that, when you are ill, you weigh up how necessary journeys are and whether alternative arrangements can be made. "A common sense approach is needed as it is possible to drive safely when feeling 'slightly under the weather', but a point may be reached when it is unwise to drive. People need to be honest with themselves about their ability to drive safely. "If you are not well enough to undertake your journey you could be putting yourself and other people on the road at risk. We know that illnesses can impair driving ability as they can slow reactions, reduce observation and even limit the ability to make good judgements. "Drivers who are feeling ill should also exercise care with the medicines they use, for instance cough syrups which can cause drowsiness and always read the label."